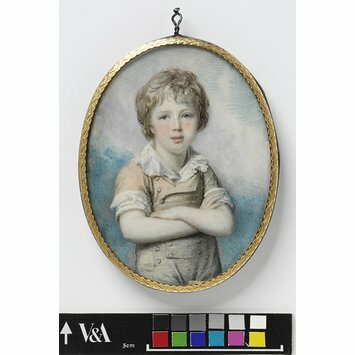 This work is almost contemporary with a portrait of another boy by Thomas Hazlehurst (Museum no. Evans.133). But while in this portrait the boy wears a form of trouser suit, in the other the boy wears what appears to be a dress. The striking difference between these two images of boyhood offers a telling commentary on the slowly shifting attitudes towards children at this time. By 1800, although little boys still wore dresses for the first years of their lives, most generally did so for less than four years. When they reached the ‘breeching’ stage, when they abandoned their dresses, they no longer graduated immediately to miniature versions of adult clothes. Instead they were invariably dressed like this boy in a so called ‘skeleton suit’. This was easy and comfortable, and as the numerous portraits of the time show, encouraged the ‘boyish’ behaviour of which this boy's pugilistic stance seems typical. Although the infant mortality rate, even among the richer classes, was still very high, the child was slowly emerging as an individual, and childhood was becoming seen as a more distinct period in life. Cosway's miniature splendidly captures this spirit. Portrait of a boy with his sleeves pushed up and his arms crossed, standing against a sky background. He is dressed in a so-called "skeleton suit". 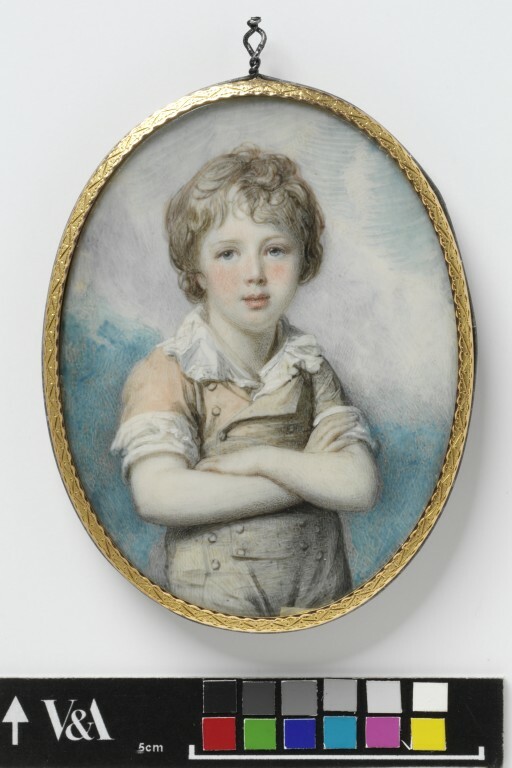 Portrait miniature of an unknown boy, perhaps Sir Frederick Augustus D'Este, dated 1799, painted on ivory by Richard Cosway (1742-1821).